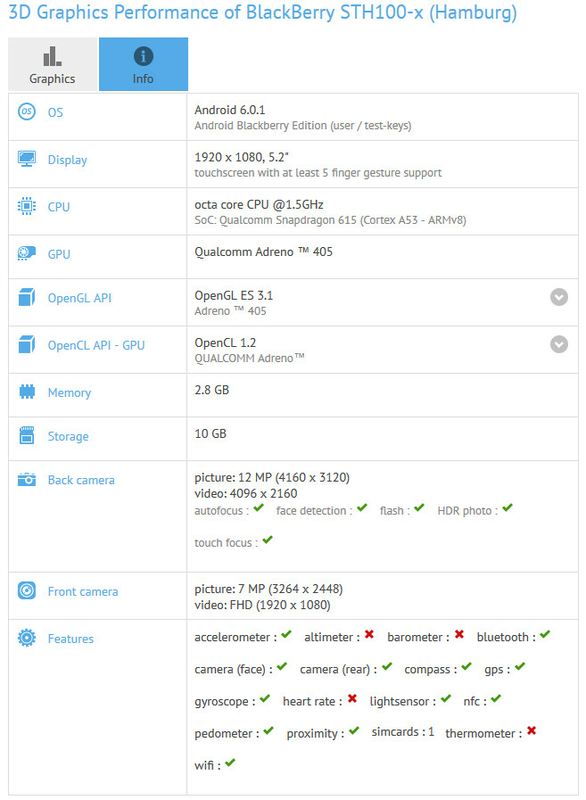 One of two Android powered handsets expected to be released by BlackBerry this year, the BlackBerry Hamburg has been put through the GFXBench benchmark test. With the latter, we now know to expect the Hamburg (just a code name) to feature a 5.2-inch display with a 1080 x 1920 resolution. Under the hood, the Hamburg sports the Snapdragon 615 chipset which carries an octa-core 1.5GHz CPU, and the Adreno 405 GPU. 3GB of RAM is inside along with 16GB of native storage. A 12MP camera adorns the back of the phone, while a 7MP (8MP perhaps?) front-facing camera is at the ready to shoot selfies and handle video chats. Android 6.0.1 is pre-installed. According to Dylan Habkirk, who is the creator of a pair of concept models for the Hamburg and the BlackBerry Rome, the Hamburg resembles the BlackBerry Z30. The BlackBerry Rome carries a physical QWERTY while the Hamburg is all-touch. Habkirk says that the latter will be the first of the two to be released. Last November, BlackBerry launched its first Android powered handset, the BlackBerry Priv. Thanks to a high price and tough competition in the market for high-end Android phones, Priv sales have been considered disappointing. CEO John Chen acknowledged pricing the Priv too high, and expects the new models to land in the $300 to $400 price range. I doubt it. BB10 is all but dead. They're focusing on Android now even though they have some catching up to do. What a stupid silly name: hamburg. Hamburger. Well, it could be worse... Say, Cheeseburg...! P.S It's just a prototype code name, lad... I'm sure it'll sound better once its released... BB might name it Perv... Rhymes with Pirv... Anyone? They usually use names of Europeans cities. Oslo (Passport), Venice, Rome, London, Milan, etc. Not as stupid as yours i bet. So offended?why? I'm a blackberry fan to. I'd dosent mean I'm blinded. Hamburg. Wtf stupid name is that for a phone?it's not even catchy nor looks right. It's the name of a major European city. I bet those Germans have better English grammar skills then you. I'm sorry, I meant skeelz. There is some definite irony in calling out someone's grammar, then using "then" instead of "than". This is the extent of you culture, Hamburg comes from hamburger?! Didn't help that it was expensive and delayed for Verizon and didn't come to Sprint at all. It should have been universally unlocked and sold directly by blackberry. It was unlocked and sold directly from BB. Correction, it was GSM unlocked, not fully unlocked. There's a difference. Are there any CDMA devices that are unlocked? I've never come across one. Verizon phones are unlocked out of the box. Universally unlocked phones carry the bands for all major carriers, including CDMA carriers. Despite what some comments say, said phones are very much relevant and significant. I never knew that. I just thought Verizon (and other CDMA carriers) phones were GSM unlocked. So one could buy a Verizon phones outright and use it on Sprint's CDMA network? No, you cannot. http://verizonwirelesslogin.org/can-i-use-a-sprint-phone-with-verizon/ Verizon is also in the process of moving away from CDMA, with it discontinuing it's CDMA network by 2020 in favor of the much more prevalent GSM. Carriers in Canada have begun to do the same thing. CDMA is a dying technology, despite what some comments say. With the death of CDMA, universally unlocked phones will also lose whatever advantage it has when compared to the higher selling GSM unlocked phones. It's 2016 and there's still millions of subscribers currently using their CDMA network or have you "conveniently" forgotten that? The only wrong with PRIV is the price. PRIV is a nice device that were overpriced. Priv should be priced $400 at launch, and $300 now. The only phone that offers the Snapdragon 820 for that price range is the Xiaomi Mi 5. Unless they want to have the same profits as a Nexus device, I doubt that they would ever offer a Snapdragon 820 for that price. I think John Chen realized the high-end Android market is saturated right now. The midrange market is barely touched because manufacturers are either offering low-end devices or high-end devices. In my opinion, Samsung and Sony are really the only ones competing in this space. Specs seems kind of soft. I wonder if it's a midrange phone. Question is will blackberry learn from their mistakes and try to not price it at a premium? agree with you. SD615 is not even midrange now. Midrange is SD650/SD652. This SD615 deserve a $150-200 price tag. Crappy specs. 4gb Ram S820 Is missing. SD 615 device for $300-$400 ??? Perhaps John Chen is not smart!!! They want the SD 808 Priv in $300-$400 price range, not some CHEAP SD 615 device!! The death of BB is only a couple of months away.